Sometimes people (especial non-IT users) are alarmed when they get an email alert about a system that RemoteToPC is on, saying that a certain computer has a “Critical” alert. 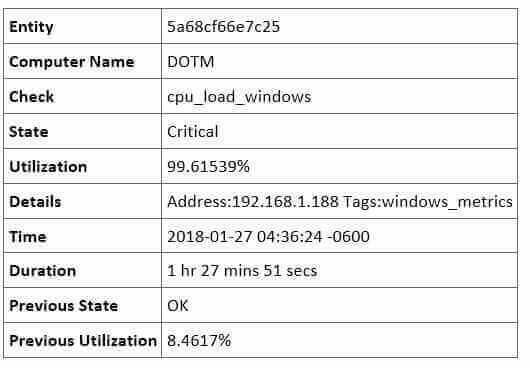 The reason for alerts is that in addition to Remote Access RemoteToPC provides active monitoring of core system metrics of CPU, RAM, and your C-Drive. If any of those system metrics goes over 95% for over a few minutes, you receive an email alert about it. In the example above, this is simply diagnostic data telling you that the CPU in that computer is being overwhelmed for some reason. You might want to check it out, run some malware and antivirus scans or something, or if it’s just a weak system, and you don’t want to receive alerts about it, you can shut off alerts for that system in your command center by clicking the green slider button for that system in the Command Center to disable alerts for it.